Achieving a place in the authorship of published scientific research is a matter of pride and fame associated with creativity, recognition, better evaluation, and financial gains. This had made assigning of authorship in a scientific publication, a complex and challenging issue. Gaining a position in authorship in scientific publications not only prompts or encourages authors to carry out more research but also recourse many of them to the unethical practice of different kinds of authorship abuses. These authorship abuses are done so cleverly and skillfully that neither the journal editors nor the readers of the journals realize that bias had crept in authorship of the publication. This nonstandard act of biased authorship has a tremendous potential to compromise the credibility of scientific research and scientific publications. The present review aims in focusing on issues pertaining to authorship and its misuse in biomedical research. Thus, it can be concluded from this review that new policies, guidelines, and laws should be made by the government agencies in association with journal editors, institution, and government agencies to curb this malpractice by protecting whistleblowers and providing adequate punishment for those who are involved. Resistance to almost all available antimalarial agents, particularly for Plasmodium falciparum, is an important issue throughout all malaria endemic countries. Recently, Plasmodium vivax also showed resistance to chloroquine in some part of the World. Monitoring efficacy of used antimalarial drugs plays an important role to determine the emergence of resistant power by the prevailing parasite population of a geographical area if any. There are four different methods for antimalarial drug efficacy study. In vivo therapeutic efficacy study remains the gold standard and provides primary data for formulating antimalarial drug policy by the National Malaria Control Programmes. Several in vitro assay methods for assessing antimalarial drug susceptibility have been developed during past few decades. These assay methods are simple, easier to handle and allow early detection of drug-resistant parasites and also for the screening of different newly developed agents for their antimalarial activity. Approaches of different assay methods for testing the susceptibility of antimalarial agents and their limitations are discussed in this review article. Background and Objective: Cutaneous leishmaniasis (CL) is one of the most important diseases worldwide, with a different range of prevalence in endemic areas. Anthroponotic and zoonotic CL are two epidemiological forms of CL, in Iran. 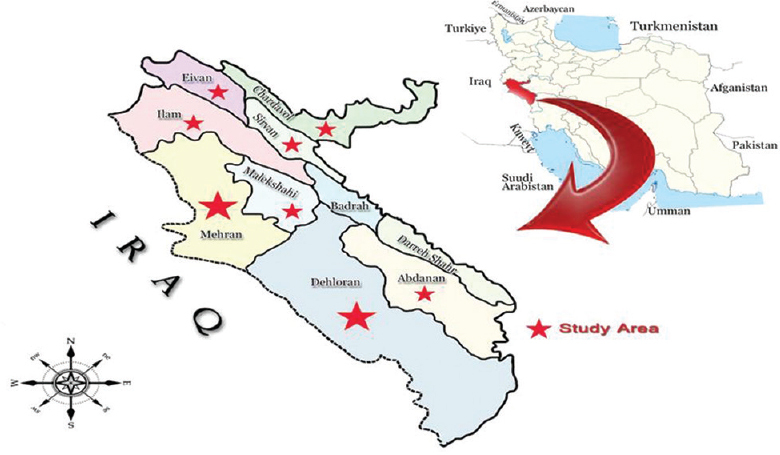 Although Ilam Province in the west of Iran is one of the main endemic areas of the disease, there is no inclusive study to determine the genetic variations of parasite in these areas. The objective of this study was to determine the genetic diversity of Leishmania species in Ilam Province, using mini-circle kDNA gene. Materials and Methods: Direct smears were taken from skin lesions of 200 suspected cases of CL. Smears were stained, screened under light microscope. Polymerase chain reaction (PCR) was performed, using specific kinetoplast DNA primers. Data were analyzed, using the molecular bio-software. Results: All the samples were positive by direct examination. 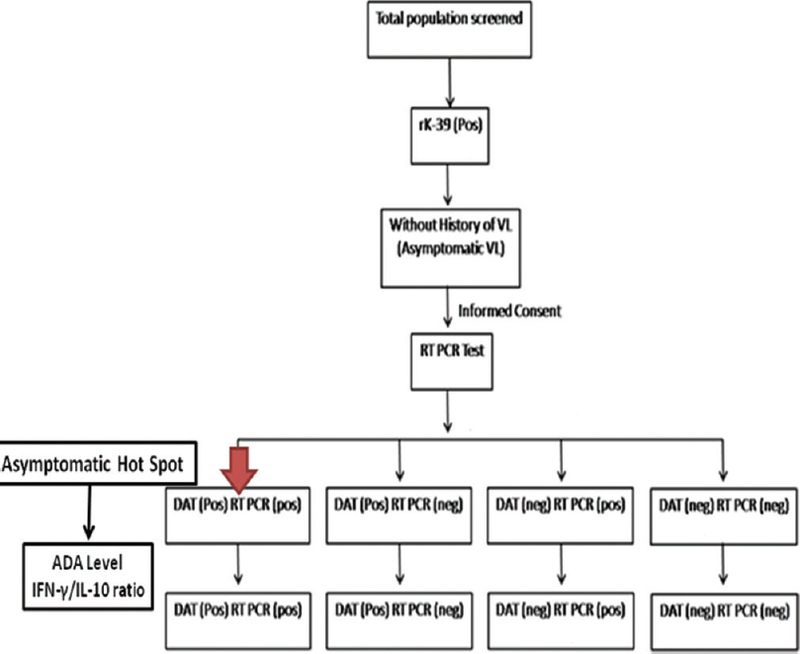 PCR results showed all cases were positive for Leishmania major. Although all isolated cases belong to a different county of Ilam province, all were positive for L. major with intra-species genetic diversity, divided into four clades in the dendrogram. Interpretation and Conclusion: This variation can affect drug resistance and controlling strategies of parasite. It is possible that different species of sand flies and rodents are the vector and reservoir of parasite, respectively; however, further studies are needed to validate this. Background: Malaria is the most prevalent infectious diseases in the world. This study aims to assess the correlation of hepatorenal dysfunction in malaria patients in pediatric age group. Materials and Methodology: This study was conducted on patients of malaria admitted in the Department of Paediatrics, PBM hospital, Bikaner (Rajasthan), during resurgence of various outbreaks of malaria in the year 2011 and 2012. The diagnosis of malaria was confirmed by examination of thick and thin smear/optimal test; malarial hepatic and renal patients were included in the study. Results: The mean age of patients with hepatic and/or renal dysfunction in malaria was 5–10 years and preponderance of males. Association between hepatic and renal dysfunction was significant as 9 (40.9%) in 22 patients with serum bilirubin >3 mg/dl had renal failure in Plasmodium falciparum (PF) and 5 (71.43%) out of 7 patients in mixed (Plasmodium vivax [PV] and PF) patients. This association was not significant in PV as 6 (10.52%) out of 57 patient with serum bilirubin >3 mg/dl had renal failure. Conclusion: The specific reason for presenting our observation is to develop awareness regarding the early complications of malaria and to prevent them prompt action can be taken. Background: Chaetogaster limnaei is an annelid symbiotically associated with lymnaeid snails as Galba truncatula. This association is considered a preventive mechanism against trematode miracidia infection, including Fasciola hepatica. 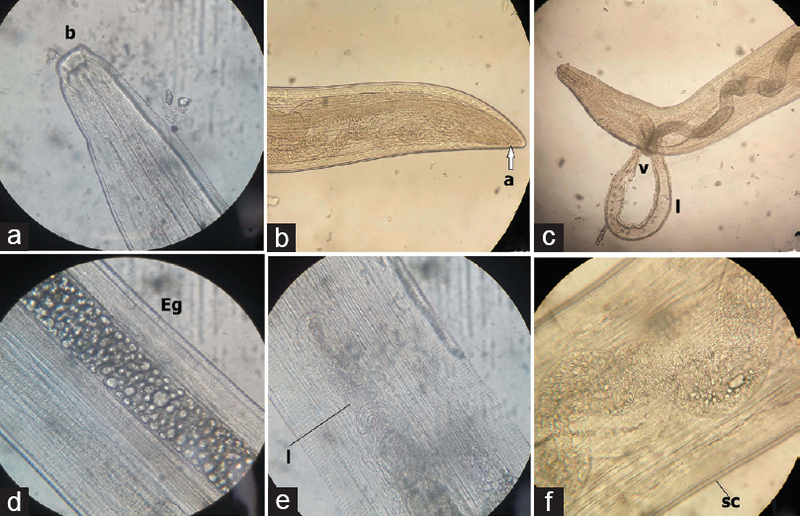 The objective of this study was to determine the effectiveness of Chaetogaster limnaei as a natural controller of Fasciola hepatica in laboratory conditions. Procedures: Fasciola hepatica miracidia were inoculated in parallel into snails carrying Chaetogaster limnaei and snails without the annelid. The degree of infection was measured after 40 days of exposure. Furthermore, the number of annelids per snail was quantified, as well as the ability of Chaetogaster limnaei to devour miracidia at different times of exposure. Results: An effective 70% natural control of Fasciola hepatica in Galba truncatula was observed. The carrying capacity of the snail was established to be of 10.6 ± 1 annelids. 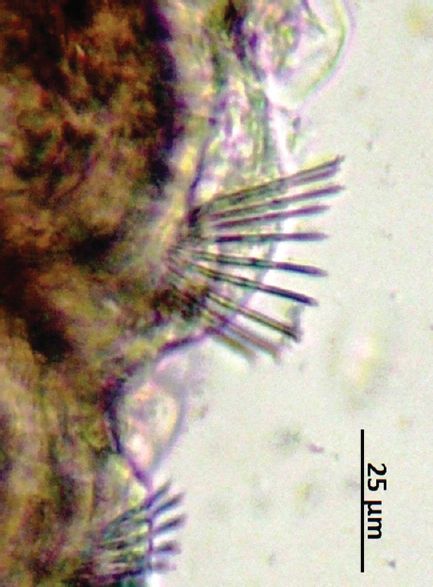 Chaetogaster limnaei is a predator of Fasciola hepatica devouring an average of 3.79 ± 0.21 miracidia. The results of these experiments have a potential value as a control measure against fascioliasis in the environment. We report here a case of human ocular thelaziasis that was discovered accidentally during cataract surgery. A 58-year-old farmer attended an eye camp for diminished vision of the left eye, which was diagnosed later on as cataract. He was referred to a tertiary care hospital in Assam. During the cataract surgery, two small, motile, chalky white, translucent worms were removed from the left fornix. They were identified as female Thelazia callipaeda. Rare occurrence of this disease and its association with both extra and intraocular manifestations leading to ocular morbidity is the rationale for presenting this case. Entamoeba histolytica infection can lead to colitis, peri-colic abscess, ameboma, perforation and rarely colonic stricture. Amebic colitis is usually managed with medical management and rarely needs surgical management. We hereby report a case of colonic amebiasis, presenting as a stricture in transverse colon, mimicking malignancy, and managed successfully. Filariasis is a major health problem of the tropical and subtropical regions, but filariae are also found in temperate climates. The disease is endemic all over India and microfilariae have been observed as coincidental findings with inflammatory conditions and neoplastic lesions. 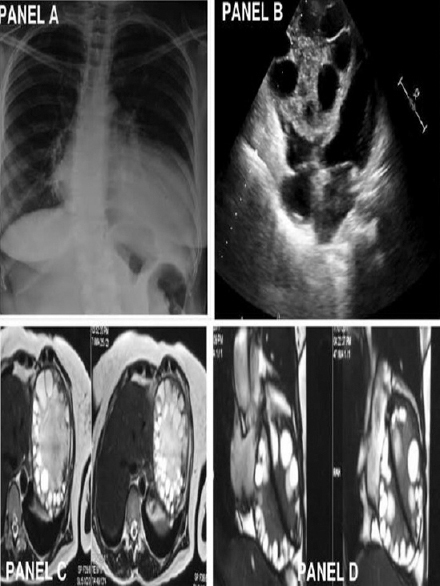 We report a rare case of a 40-year-old female from a nonendemic area presenting with lump in the left breast. The skin overlying the mass was fungating and ulcerated. 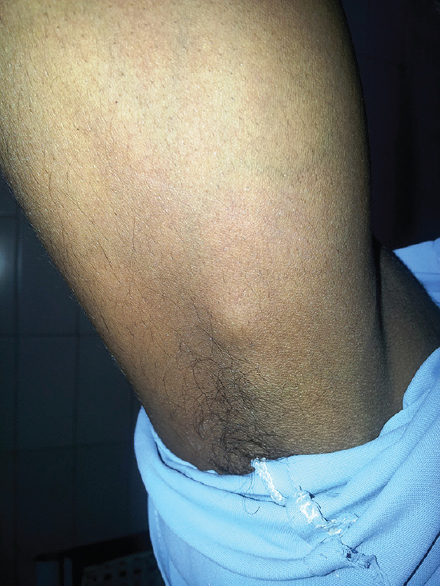 Ipsilateral axillary lymph nodes were palpable. Fine-needle aspiration cytology revealed highly cellular smears having ductal epithelial cells arranged in groups, tight clusters, and scattered singly. Cells were large, having pleomorphic round to oval nuclei with prominent nucleoli. Along with these tumor cells, sheathed microfilariae of Wuchureria bancrofti were seen, suggesting a diagnosis of ductal carcinoma with coexistent microfilaria of W. bancrofti. Findings were confirmed on histopathology of the resected specimen following modified radical mastectomy. Coexistent pathologies should always be considered while reporting. 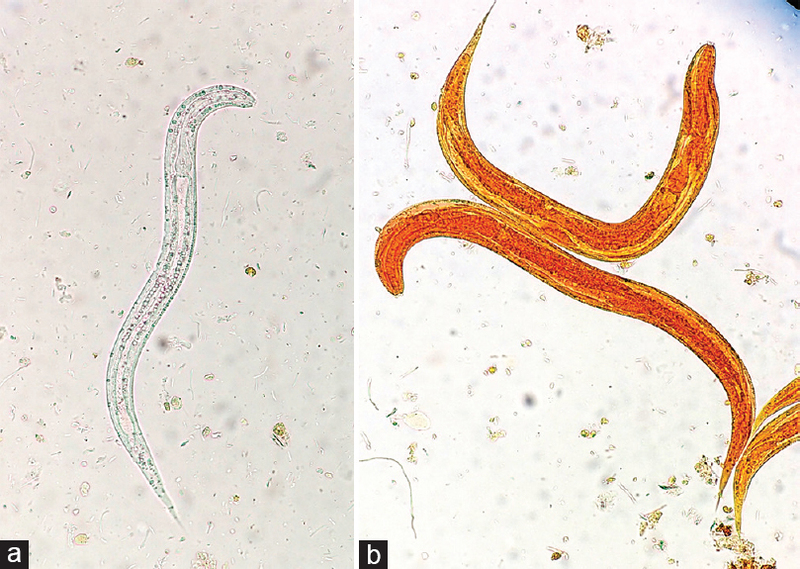 Strongyloides stercoralis is one of the most important helminths causing neglected tropical diseases. Its ability to cause autoinfection can lead to chronic infections and hyper infection, especially in autoimmune cases and prove to be highly fatal. We report a case of systemic lupus erythematosus (SLE) having hepatitis-B coinfection, who presented with rash all over the body, recurrent nausea, vomiting, cough, loose stool, and joint pain for 1 month and was later on found to be infected with S. stercoralis. He suffered a massive cardiac arrest during his hospital stay, which was efficiently managed. S. stercoralis infection in cases of SLE and other immunocompromised conditions must be treated at the earliest, to prevent fatal cardiac arrests and other complications. Zoonotic filarial infections particularly dirofilariasis have been reported worldwide. The route of transmission to human beings is vector-borne through mosquitoes. Increased mosquito activity subsequent to global warming has influenced the transmission of dirofilarial infection in many geographic regions, including Asia. Dirofilariasis presents as mucocutaneous and pulmonary infections. Dirofilarial infections rarely manifest in the oral and perioral region and can pose to be a diagnostic challenge to clinicians. 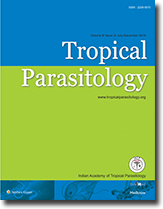 We report the first case of oral dirofilariasis in Goa, India. Hydatid cyst is a zoonotic disease caused by the cestode Echinococcus granulosus. Humans are incidental intermediate host. Liver and lungs are most common sites involved in hydatid cyst. Spleen, kidney, central nervous system, thyroid, breast are other rare sites. Here we present a unique case of a 48 yr female having isolated hydatid cyst of spleen, with the cyst having ruptured into the splenic flexure of colon. Hymenolepis diminuta, also known as rat tapeworm, infects humans uncommonly. 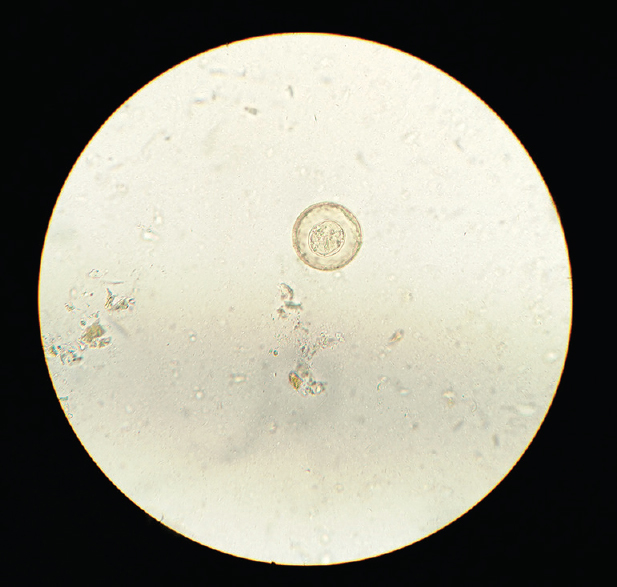 The diagnosis is based on the demonstration of characteristic eggs in the feces. 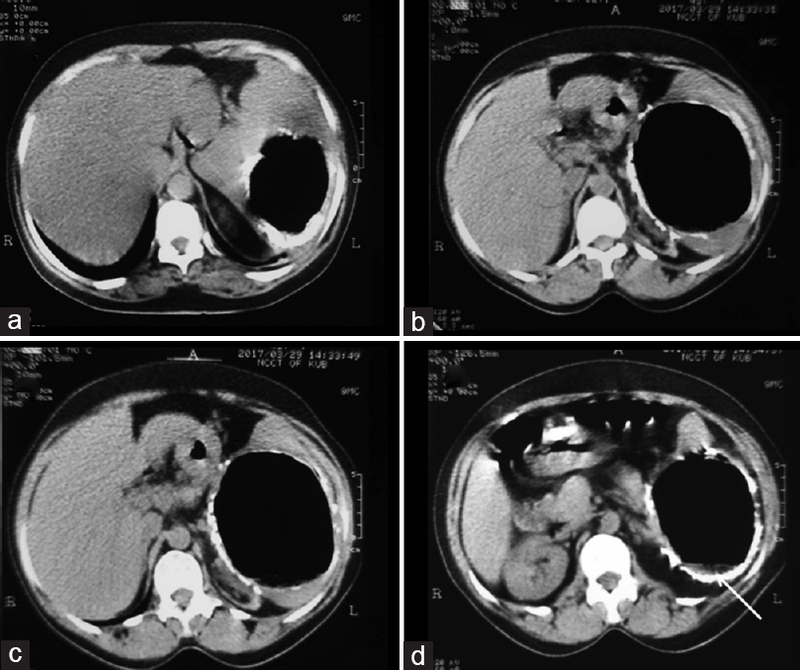 We present a case report of H. diminuta infection in a 6-year-old female child from an urban area of India who presented with fever and seizures and also had complaints of intermittent abdominal pain, vomiting, and loss of appetite, without an apparent history of contact with rodents. The infection was treated with albendazole and showed clinical and parasitological cure. More awareness is required for a better understanding of epidemiology and transmission routes of this rare zoonosis. Detection of adult gravid filarial worm in fine-needle aspiration cytology (FNAC) smears is unusual despite the high incidence of this parasite in endemic zones. Bancroftian filariasis presenting as subcutaneous nodules is very rare, and only a few cases are reported in literature. 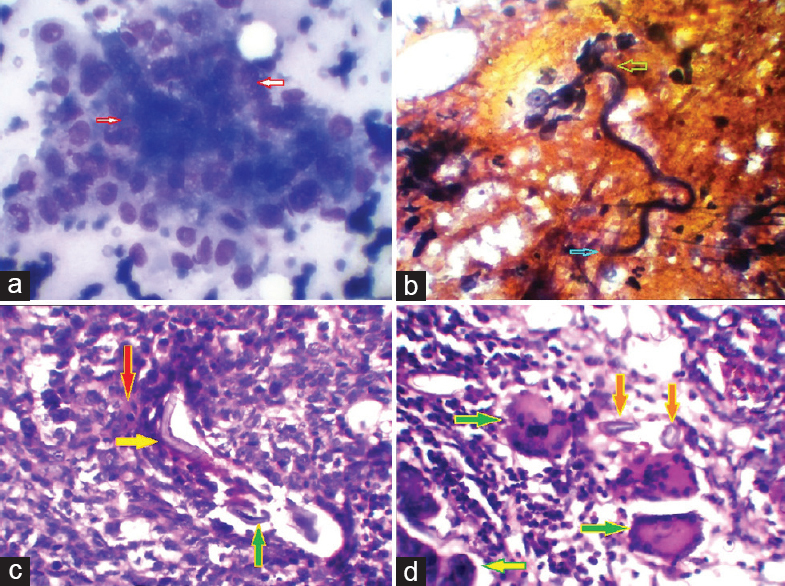 In spite of various reports stating the presence of microfilaria using aspiration cytology in various sites, the presence of an adult gravid filarial worm in subcutaneous nodules by FNAC is an extremely rare finding. We hereby report an unusual case of detection of adult gravid worm of Wuchereria bancrofti on FNAC of a subcutaneous nodule in the axilla. In differential diagnosis of subcutaneous nodular swellings, a possibility of filariasis must be kept in mind, and a careful search should be done for the adult worm or microfilaria in the aspiration smears done for an accurate diagnosis. The conventional method of diagnosis of filariasis is by demonstration of microfilaria in the peripheral blood smear which may be diurnal or nocturnal. Buffy coat can be helpful in detecting microfilaria in asymptomatic cases with peripheral blood eosinophilia.